from 3 pcs. 3.25 CHF ea. from 10 pcs. 2.85 CHF ea. from 20 pcs. 2.65 CHF ea. from 40 pcs. 2.45 CHF ea. A magnet for the serious magnetist (magnetopath, magnetologist, magnetician?). Only someone with very strong hands can separate two of these magnets from each other. Very impressive. Not for children or magnet weaklings! 1 pc. 6.30 CHF ea. 1 pc. 10.85 CHF ea. 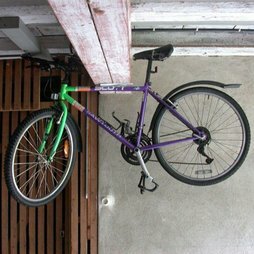 Detailed view of bicycle hanging from a steel beam. The contact area between the bike frame and the magnet is small - but nevertheless it holds. If you are not careful when removing these magnets, a bit of skin might be pinched... "He howled like a little dog"... clear enough? But the plate must be thick enough... this arrangement would slide off of a normal "white board". Thomas L. from Hamburg has visually proven with his exercise equipment that the Skin Pincher magnet can really hold 10 kg! Our customer E.M. writes: "It is so scary I had to send it to you anonymously...."
Well, this is just one example of things better not to be stowed away "safely" with a magnet!! !